Tucked away in the Marin Headlands near Sausalito is the phenomenal Marine Mammal Centre. It’s an unassuming building made of breeze (cinder) blocks – not particularly interesting from the outside. But inside? That’s another story. The Marine Mammal Centre is the largest marine mammal hospital in the world, and it happens to be on our doorstep. It rescues 600-800 mammals every year, most of which are seals and sea lions, though the occasional sea otter, dolphin, or whale makes its way there too. A hotline means that Joe Public can call in if ever he sees a stranded animal, and the Centre will send a truck to collect it. If Joe is still around when the truck arrives, he gets to name the animal too (which has resulted in odd nomenclature, such as a female California sea lion named Steve, and a male harbour seal called Miss Smarty Pants). 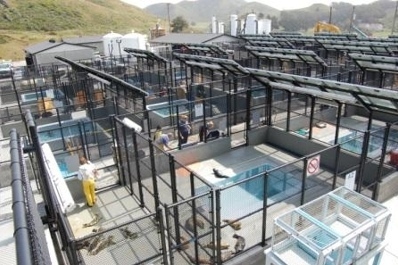 The Marine Mammal Centre then treats and rehabilitates the animals until they’re ready to be released back into the sea. Sea lions can find themselves stranded for a number of reasons. If they’re pups, it’s probably because they’ve become separated from their mothers and can’t fend for themselves yet. If they’re older, they might be malnourished, ill (sea lions get cancer too), entangled in nets, or poisoned (more on that later). This Spring was particularly busy because there’s a weird warm blob in the ocean (that’s a technical term, and it means that the sea has a fever (kind of)), which triggered two major problems. The first was that fish don’t like the warm water, so they swim deeper. Seal and sea lion pups can’t dive that deep, or don’t know where to look for fish, so they starve. Or their mothers have to stray too far from their pups to find their own food, and don’t come back. The second problem caused by the warm blob is that the warmth of the water has caused a blue-green algae bloom. The bloom – which happens to contain poisonous domoic acid – is eaten by small fish. As the poison goes up the food chain through small fish to bigger fish, it becomes more concentrated. The sea lions that eat the bigger fish develop seizures – the symptoms of poisoning. Domoic acid causes the hippocampus to shrink, affecting the GPS part of the brain and causing the sea lion to get lost or fail to remember where to find fish. The Marine Mammal Centre does a terrific job of rehabilitating the animals that pass through its pools, and educates the public at the same time. And so many animals go through the Centre that it’s also a Mecca for research, providing opportunities for marine biologists and vets to study the creatures in depth. But the Centre’s benefit to the world is greater even than providing professional and public access to marine life. It also conducts a necropsy on every animal that has the misfortune to die during its stay, providing access to marine death too (a necropsy is an autopsy performed on anything that’s not human. Talking of necropsies, there’s a photo of a disembowelled sea lion at the bottom of this blog, so look away if you’re squeamish). Ill and malnourished mammals probably have dysfunctional organs, but entangled mammals might not. So, by conducting necropsies on all animals, the Centre can provide a comparison between healthy and unhealthy organs. And there’s more. The research that the Centre does on domoic acid toxicity helps humans directly. The disease is a neurological problem that can be passed to humans through shellfish, so the presence of toxicity identified by the Marine Mammal Centre results in shellfish hauls designed for human consumption being monitored constantly. What’s more, domoic acid toxicity is very similar to temporal lobe epilepsy, so research into domoic acid helps epilepsy research too. Sea lion necropsies. 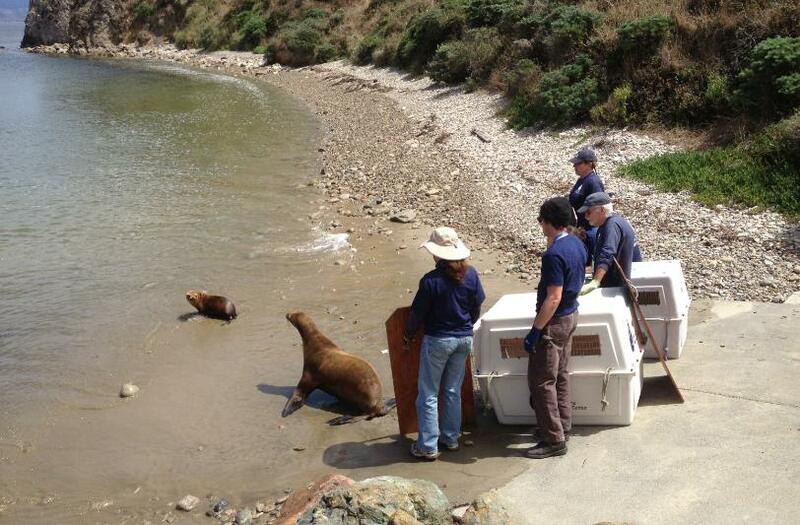 While we were watching these two, a 500lb sea lion was brought in that had been alive just 15 minutes earlier. That really focussed the mind on mortality.